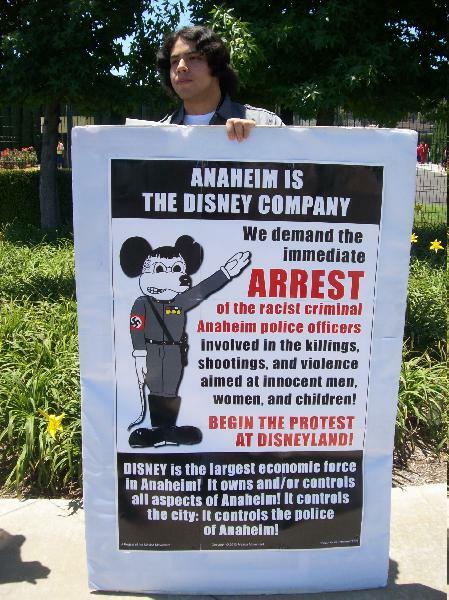 Demonstrations at Disneyland, the most powerful economic force in Anaheim, occurred both Saturday and Sunday, with a turnout ranging from 10 to 15 on the latter. Another couple hundred people were en route to join us (having just demonstrated outside the police headquarters) but were barred by police (as organizers learned via cell phone communications). 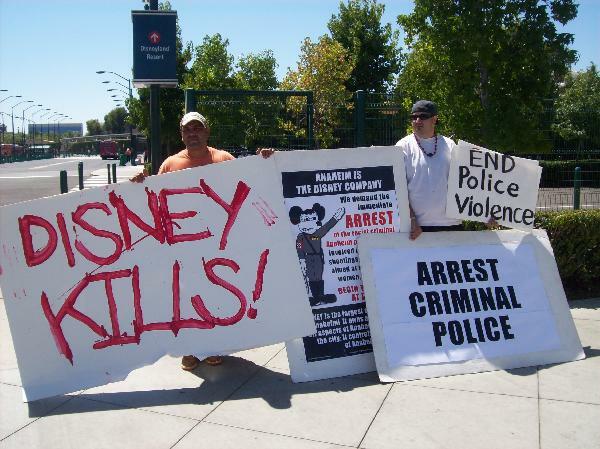 In the aftermath of the the latest killings by the Anaheim Police Department (in this case Manuel Diaz, age 25, and Joel Acevedo, age 21), protests were held throughout Anaheim. Over the weekend, targets included the Anaheim Police Department and entrance to Disneyland�the most powerful economic force in the city. Demonstrations at the latter occurred both Saturday and Sunday, with a turnout ranging from 10 to 15 on Sunday. Another couple hundred people were en route to join us (having just demonstrated outside the police headquarters) but were barred by police (as organizers learned via cell phone communications). 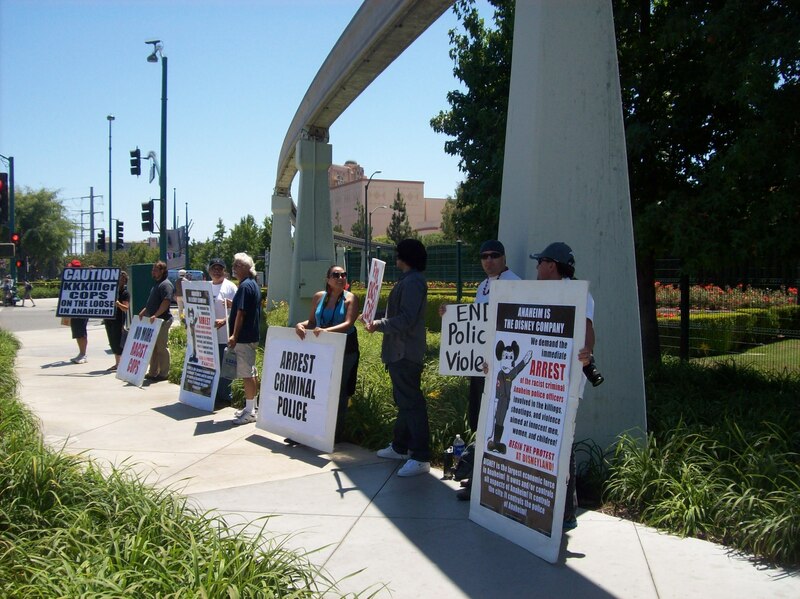 Report and pictures here: http://la.indymedia.org/news/2012/07/254559.php. 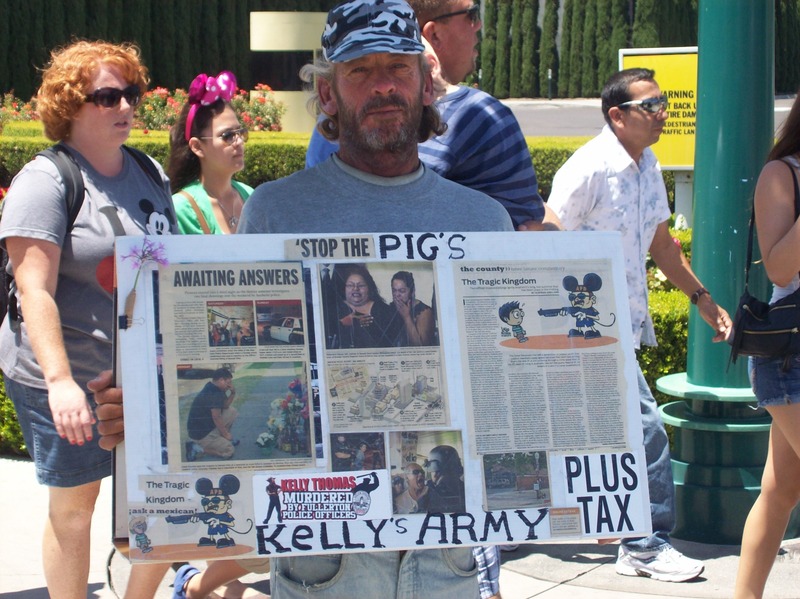 Most signs emphasized murderous, racist cops, but one drew attention to Kelly Thomas, the homeless man with mental issues killed by police in Fullerton last year. There was significant honks of support from vehicular traffic, but some motorists made obscene gestures and/or shouted ignorant, racist remarks. 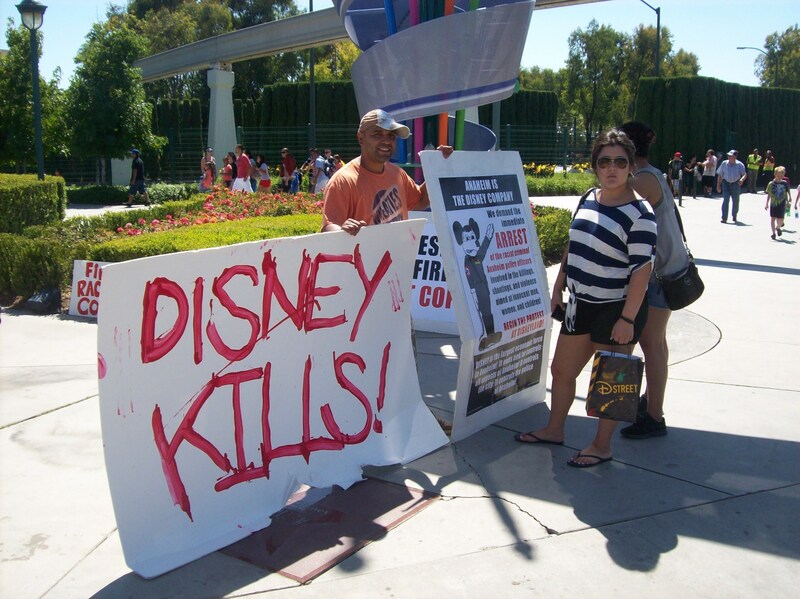 A female Disneyland employee stopped and talked with various demonstrators for about 15 minutes. She reportedly stated that she regarded this issue as an immigration matter. 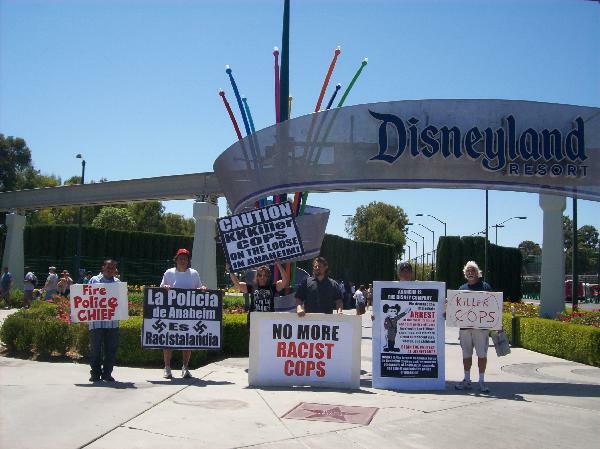 One guest exiting the park with her family told ABC News she thought it was �sad� that demonstrators were trying to diminish people's day at the Happiest Place on Earth. However, she and her family did not let the demonstration taint their experience. �We had a blast,� she said. 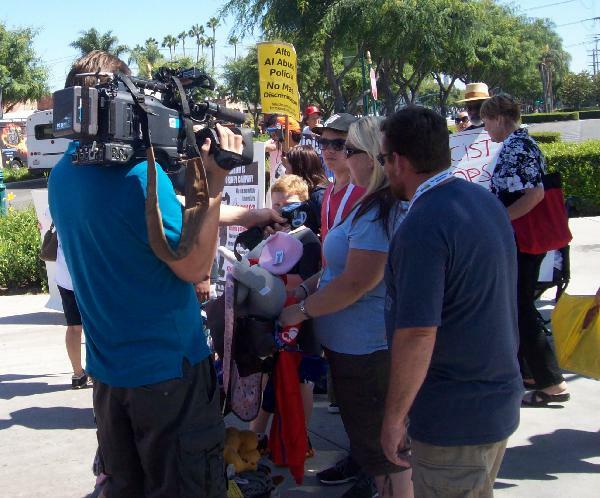 Fox News was also there and asked an organizer the types of questions one would expect from Fox. Afterward the reporter made a stench about being photographed by onlookers but then claimed he liked it. 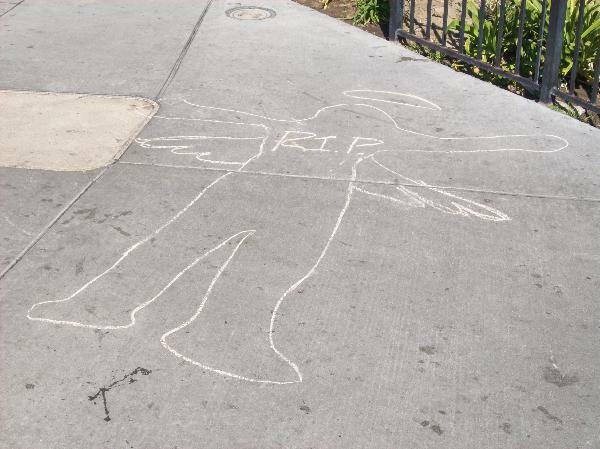 A memorial for the victims was planned for 6pm. Demonstrators beneath monorail track, Harbor Blvd. 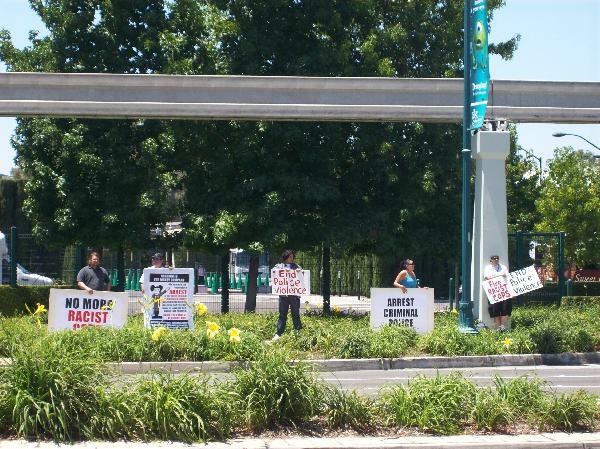 Demonstration as seen from across Harbor Blvd. 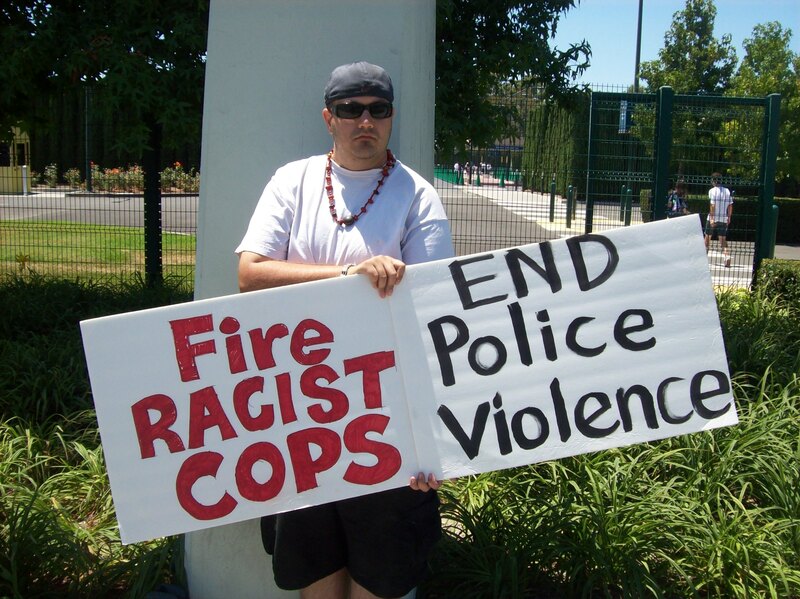 Yet another casualty of excessive, out-of-control police force: Kelly Thomas, who was known to have symptoms of schizophrenia, was beaten to death by Fullerton police almost a year ago. ...one of them got startled when she saw me photographing her. 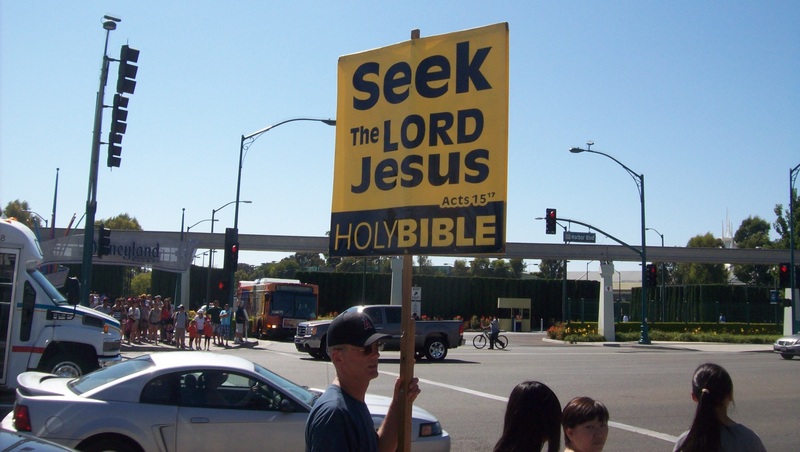 Late in the day, a Christian group appeared, calling on everyone to repent. Reportedly they stand outside Disneyland every week with lots of literature.